When times are tough, one of the worst feelings is that you are all alone. Believing that nobody else really knows what you are going through and that you have to figure it out yourself weighs heavily. Kids need help getting through challenging times and so do parents! It can be easy to miss that one of your family members is struggling. One of the best things you can do to prevent these feelings of isolation is to have regular, planned opportunities to communicate. Family meetings are a way to make this happen. Weekly family meetings provide a structure for regularly communicating about important issues. Pick a day of the week that works best for your family. It might be Sunday evenings so you can get on the same page for the upcoming week. Perhaps a Thursday or Friday night works better. The important thing is to pick a day and time that your family can commit to setting aside every week. These meetings should be short – 30 minutes works well. This means there will only be time for a few agenda items and the rest will have to wait until the following week. Family meetings are a chance for everyone’s voice to be heard. This is not a time for lecturing by parents. It’s a time to pull together as a family to figure out how to support each other. You can put a piece of paper on the refrigerator or a bulletin board where anyone can add agenda items. For example, if your kids complain that they are too rushed in the mornings, you can ask them to put that on the agenda. Setting a positive tone at the beginning of the meeting is important. You can do this by first deciding who will have each role in the meeting. Next provide time for noticing what is going well and giving compliments. Often one of the agenda items is the schedule for the upcoming week. Knowing who has to be where and when is critical for busy families! When Mom comes home from work, the house feels chaotic. Dad would like more help in preparing and cleaning up from meals. One child feels stressed due to being rushed in the mornings. The dog is not getting out for a walk every day. There are shoes and jackets all over the front entry way. The kids are hungry when they get home from school and can’t find snacks. After stating the problem, the next step is to brainstorm possible solutions. Write down all the ideas. This is not the time to judge whether the ideas will work, just write them down. 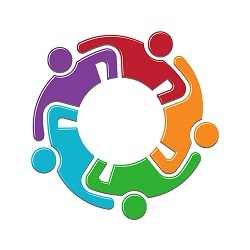 Once you’ve thought of some possible solutions, circle the ones that meet everyone’s needs. Let the person who brought up the problem choose which idea to try first. Know that you’ll revisit how it’s working in next week’s meeting. If the solution is not working well, you can choose a different option. 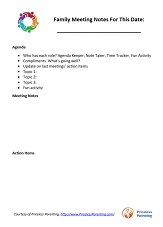 You can print out this family meeting notes page for tracking your meeting. By writing down the decisions you make, you’ll be able to come back to them the following week to see how it’s going. You may need to tweak some of your solutions if they aren’t quite solving the problem. It’s easy to forget what you have committed to trying if it’s not written down. This is also an opportunity for everyone to agree on what was decided. Putting each weeks’ notes in a notebook or folder will allow you to look back and see how far you’ve come! Family meetings are a wonderful tool for making positive changes in your family. You could make the first meeting an introduction to the concept of meeting – having someone taking notes, having an agenda, keeping track of time and planning something fun for the end of the meeting. Explain how family meetings can help everyone solve problems and keep the household running smoothly. Let everyone know how to add items to the agenda. End with something enjoyable like a quick game, song, treat or story. Kids thrive on schedules and certainty. Weekly family meetings provide consistency for addressing problems and finding solutions. Life is so much better when you feel “we’re all in this together”!